A Winnipeg athlete's hip surgery was supposed to transform his life, but led instead to a nightmare of pain and illness that hasn't let up. The problems with metal-on-metal hip implants have prompted calls from Canada's orthopedic surgeons for mandatory participation from all provinces in a national joint replacement registry. Neil McRitchie, 62, suffered rare adverse reactions — metallosis and systemic effects of cobalt and chromium poisoning — from the corrosion of his metal-on-metal hip devices, which are made up of a metal ball and cup. The complication was flagged by countries with mandatory joint registries several years before Mcritchie had his removed. "I'm pretty beat up. I've had five hip surgeries now. It's a little bit of a hit to your force field shields," said McRitchie. "I feel exhausted. That's how I feel. I feel that I need a beach to lay on for a year. That's how I feel. I feel like I've been through a lot." McRitchie is a kung fu instructor and chiropractor in Winnipeg, but now he is too fatigued to teach and too weak to perform the physical effort required for his job. He suffers other problems: disruptions to his vision and hearing, shortness of breath, heart palpitations, mood and mobility issues — all related to metallosis and metal poisoning, something he'd never even heard of back in 2006 when the arthritis in his hip brought him to his surgeon. McRitchie was the ideal candidate for what was then touted as a solution for active people: hip resurfacing, which covered the head of his femur with a metal finish. But it left one leg longer than the other, which caused him pain and problems in his right hip as well. So in 2008, he agreed to what he said his surgeon suggested, the "newest model of hip": an all-metal Birmingham system with a large metal head that would give him "a lot of stability and tremendous range of motion," an offer the fitness buff couldn't refuse. Today, after several litigations against manufacturers, 13 product recalls in Canada and complications causing revisions in thousands of patients, metal-on-metal implants only account for about one per cent of hip surgeries done in Canada, according to Health Canada, which is also conducting its own review of the devices. At first, McRitchie's new hips lived up to their hype; for several years, he felt great and could move again. "Things slowly started to go wrong," he said. "It was very low-level stuff and it started to creep up. Over time it ramped up and ramped up and ramped up, and I never could really figure out why I was having these problems." He started to get sharp migrating pain throughout his legs that no one could explain. He suffered excruciating bouts of insomnia and was constantly exhausted. He lost his appetite and about 30 pounds. Unbeknownst to McRitchie, Health Canada issued a warning about metal-on-metal hips in 2012 — about five years before his symptoms began — highlighting the very problems he was experiencing. As the metal ball and socket of the implants move against each other, they can release metal ions, which can accumulate in soft tissues or in the blood. The resurfacing system McRitchie got in 2006 was recalled from the market in 2009. 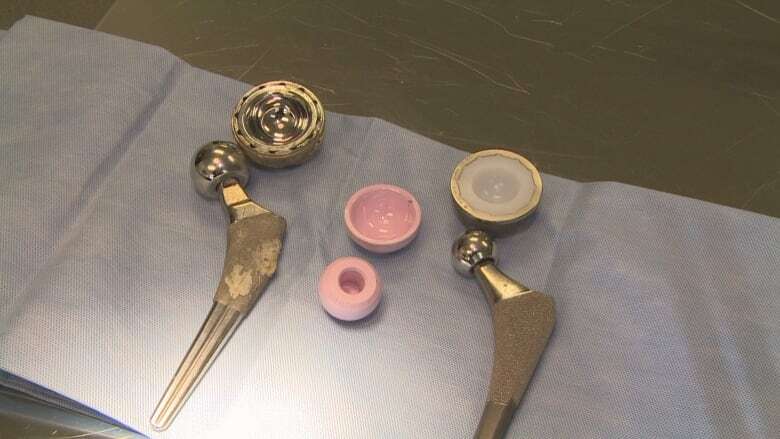 The Birmingham acetabular cups and femoral heads he'd had implanted in 2008 were recalled in 2015 due to a high revision rate, years before they'd be removed from McRitchie's body. He continued to lose weight, mystifying his general practitioner, who suspected he might have cancer. "He said, 'Look, you're super healthy.' 'Then why can't I sleep? Why can't I eat?' Nobody could give me an answer to these things." It wasn't until the pain became localized in his hip that McRitchie went back to his surgeon in 2017. By this time, he also had other unexplained symptoms: depression, tinnitus, vision disturbances, shortness of breath, heart palpitations, even his voice had inexplicably changed. Blood tests came back with high levels of cobalt and chromium. So, McRitchie said, the surgeon replaced the left metal hip implant with one that had a ceramic head and polyethylene socket. "I just went through nine miles of bad road. I mean, I just had months of sleep deprivation, massive pain, like ridiculous amounts of pain, where I just couldn't take it. So much pain, it didn't make sense to me," he said. "And as a chiropractor, I'd be thinking mechanically: how can this kind of pain be possible? But it's because it has nothing to do with mechanics. It's got to do with toxicity. Metal that's affecting the body and affecting the nerves." The pain returned with a vengeance in his right hip several months after surgery on his left. "[Five] months ago, I started to go through the entire process again. Everything started to ramp up again," said McRitchie. He went back to his surgeon, who immediately knew McRitchie was having a reaction to cobalt and chromium. This past summer, he had the second device replaced too. Although hip surgery is generally successful and helps millions of people a year, surgeons — like Canadian Arthroplasty Society president Dr. Michael Dunbar and Dr. Eric Bohm — say the complications from metal-on-metal hips highlight the need for better data collection in Canada. The complications of metal-on-metal implants were first flagged by the United Kingdom and Australia in 2010, both of which have robust joint registries with mandatory data collection. Dunbar said while the quality of Canada's registry lagged behind the U.K. and Australia 10 years ago, we're rapidly catching up — in large part because of the problems with metal-on-metal hips. "It crystallized the argument, made it that much more clear, that we should be doing it too," he said. In 2012, British Columbia and Ontario mandated participation in the Canadian Joint Replacement Registry, housed by CIHI. Manitoba mandated it in 2013. It's also now mandatory in Nova Scotia. Bohm, who co-chairs the national joint replacement registry, started a separate registry in Manitoba for hip and knee surgeries in 2004, which also tracks patient-reported satisfaction with their surgery a year later. Of the roughly 110,000 joint replacement surgeries performed in Canada each year, about 70 per cent are reported to the national registry, he said, a number he'd like to see jump to more than 90 per cent in order to have dependable data. The information is already gathered by hospitals, he said, and it's just a matter of provincial support for implementing data collection methods and protocols. "It boggles my mind that we're doing this very high-volume medical procedure that costs a lot of money and not properly tracking the outcomes of what we're doing," Bohm said. "I also think it's a bit embarrassing for Canada that we didn't have a national mandatory registry for so many years, and I'm hoping that these kinds of things really spur the provinces into making it mandatory." McRitchie is involved in one of several class-action lawsuits against manufacturers of metal-on-metal hip devices. Smith & Nephew, which made the Birmingham hip resurfacing (BHR) system he had implanted in 2006, is named as the defendant. Guardian Law Group received certification for the class action in 2016. Both McRitchie's Smith & Nephew implants from 2006 and his 2008 replacement devices are among 13 metal-on-metal devices that have been recalled in Canada in the past 10 years. "Smith & Nephew is always sorry to learn of a patient that has experienced difficulties following surgery and we take any complaint about our products very seriously. These would be investigated thoroughly by our in-house vigilance and medical teams and, wherever appropriate, reported to national regulatory authorities," wrote a spokesperson for Smith & Nephew, adding that they could not comment directly on a patient's health status. "The [Birmingham hip resurfacing] device performs better overall than any other metal-on-metal hip resurfacing device," wrote the spokesperson. "We are confident that the BHR is a safe and effective product for use in appropriate patients and circumstances," the statement read. 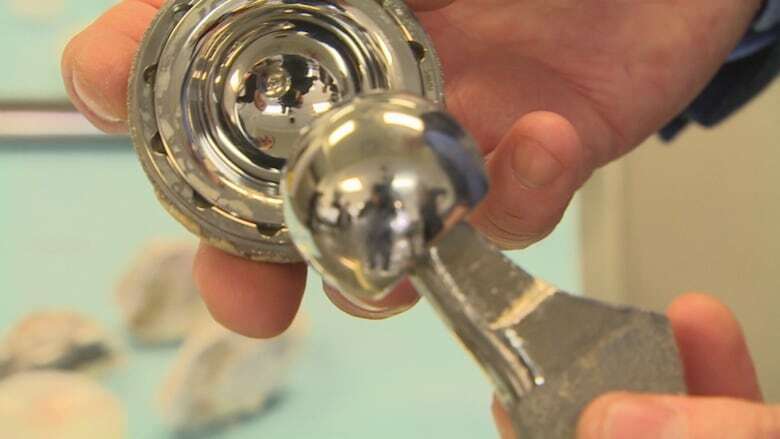 An orthopedic surgeon in Alaska — who had metal-on-metal hip implants and developed metallosis and cobaltism — believes no amount of metal in a hip implant is safe. "The bottom line is, they're still being done. The more critical problem is there were about a million done in North America. And it's the exceptional patient that knows what type of hip they have," said Dr. Stephen Tower, who also stars in the Netflix series The Bleeding Edge about problems with the medical device industry. Health Canada has recommended yearly followup with patients that have had metal-on-metal hips, and "closer followup" for those with elevated metal levels. McRitchie says his surgeon is partially responsible for not giving him ample warning of possible complications, even after his devices were recalled. But mostly, he blames the companies who made them. "I think, at the very top of the food chain I hold the manufacturers of these appliances and the regulating bodies that OK'ed them, that's who I'd firmly place my blame on as to who caused this to happen to me," said McRitchie. Lawyer Doug Lennox, who has been involved in class-action lawsuits against manufacturers of metal-on-metal devices by Zimmer, Dupuy, Biomet, Smith & Nephew and Stryker — one of which has been settled — calls the metal-on-metal hip an "industry-wide failure." "One of the things the class actions has accomplished was to notify patients of recalled devices, something which the regulatory system should have done, but didn't," said Lennox. He said in three of the class actions, his firm got court orders that required the hospitals to call and notify all patients who received the metal-on-metal implant from that manufacturer. "I can't tell you the number of clients I've talked to, who, upon hearing of the class action, understood why they were in such pain," he said. According to a spokesperson for the WRHA, the Manitoba registry would have identified any patient whose implant was recalled, and that patient would have been contacted. McRitchie denies he was ever informed. "The fact that you're living with this toxin in your body actually makes me wonder why the people that had this aren't told that they had this. Because there's a lot of people out there, I'm sure, that had these hips — and they're not warned," he said. 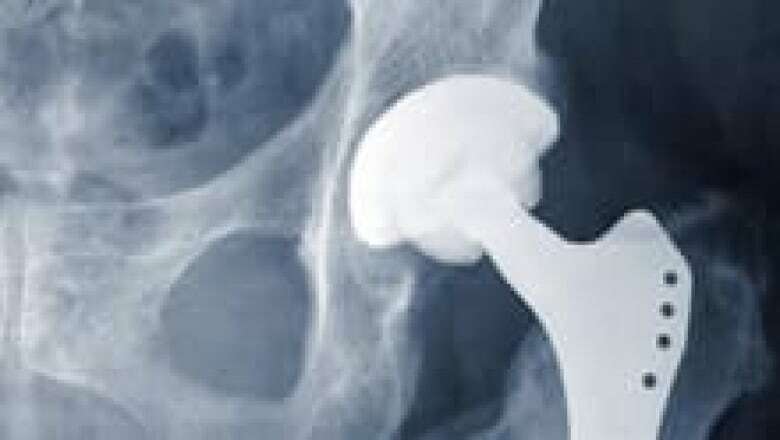 Health Canada is currently undertaking a review of all scientific and clinical information about metal-containing hip implants, according to a spokesperson, an action triggered by information in scientific publications. It will make the results of its review public, and may issue more communication about the devices "if appropriate," the spokesperson said. In the past 18 years, Health Canada has received 829 incident reports related to metal-on-metal implants. Metal ion issues were part of 20 of those incident reports, according to Health Canada. While metal-on-metal surgeries were performed on close to 50 per cent of patients in the U.K. and about 30 per cent of patients in the United States, according to Dunbar, the numbers in Canada were "likely closer to five per cent," in large part because of Canada's public health-care system. "By being conservative and evidence-based, patients in Canada had less exposure to metal-on-metal bearings," said Dunbar. But that doesn't minimize the impact on those who suffered or are suffering a reaction. McRitchie may no longer have the metal-on-metal implants in his body, but he says he's still suffering. Recent bloodwork showed elevated levels of chromium and cobalt in his blood a month after his right hip implant was revised in September. He still has trouble sleeping, he is moody, fatigued, experiences "raging tinnitus," problems with his vision, shortness of breath and heart palpitations. He used to speak fluent Mandarin, but has noticed a marked decline in his ability to converse with his partner. "Something's happening to my brain," he said. "I'm forgetful." He knows he's at risk for more serious complications, like cardiomyopathy and renal failure, but is on a one-year wait list for an echocardiogram to test heart function. "The things that worry me are the things that are proven through science already," he said. The FDA warning for metal-on-metal hip implants lists cardiomyopathy, skin rash, auditory and visual disturbance, psychological status changes and renal impact among other possible side effects from cobalt. "It's a known entity, it's known to be toxic," said Tower. "No one doubts that cobalt is toxic. The controversy is, you know, what are the thresholds for safe exposure? And what I think we're learning from the study of my own patients, is for some patients, there is no threshold for safe exposure, if you're dealing with probably 10 per cent of patients that react in an immune fashion." McRitchie's speaking out about his experience to warn others of the risks that were never shared with him by his doctors, he said. "That to me is unconscionable. I'll use the word. I think it's unethical. That people who are in harm's way are not told where they're standing," he said. The one "godsend" of the entire experience is that he's found "his tribe" in an online group called Total Hip Replacement News: a website where hundreds of people who have suffered or are suffering from metal-on-metal issues come together to share their experiences. The group gave him a deep sense of community, he said, and a sense of duty to speak out about what happened to him. "You're not alone," he wants others to know. And to anyone expecting hip surgery? "Become informed. Because no one's informing you."